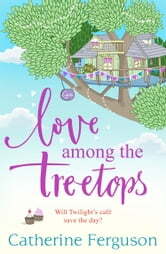 Can love flourish amongst the tree tops? When pastry chef Twilight Wilson was a young girl, she would hide from school bullies up in the treehouse at the bottom of her garden in her family home in Sussex. It was her special place, and even as an adult she still loves it. So when her family tell her they can’t afford to live there any more, Twilight is devastated. Not only will they lose their home – but the treehouse too! She comes up with a plan to save the family home – she’ll start up a cafe in the treehouse! It’s a brilliant idea, and excitement builds as she starts planning the menus, with the help of Theo – a rather attractive man from the gym. But when former school bully Lucy finds out the plan, she starts plotting – and opens her own rival cafe in the village! Can Twilight save her family home? Will her friendship with Theo ever be anything more? And who will win the cafe wars? Catherine Ferguson is back in this hilarious, heartwarming read perfect for summer. A nice,gentle meander through a great literary work. Easy to read with memorable characters but with a plot that brings excitement. Keep them coming.